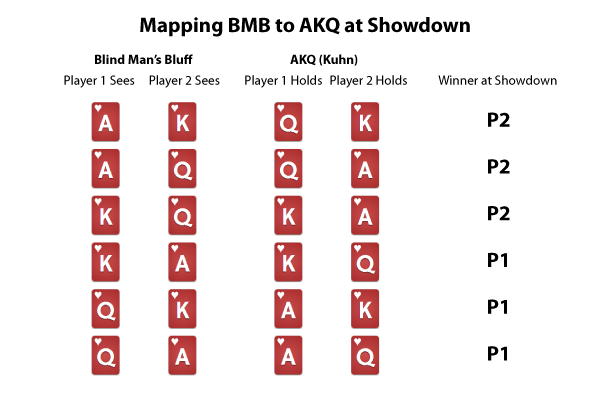 In The Mathematics of Poker (TMP), they walk through solving what they call the AKQ game, which is also known as Kuhn Poker. Kuhn poker was invented decades ago by a famous American mathematician from Princeton who was a friend of John Nash (inventor of Nash Equilibrium and basis for the movie A Beautiful Mind). It is one of the simplest games I am aware of that directly teaches fundamental poker concepts that most experienced players use on a daily basis. A three player version of the game, with a 4 card deck is going to be one of the events in this years ACPC (annual computer poker competition), which I am planning to enter. I'll discuss that more in a future post. The AKQ game uses a 3 card deck with an Ace, a King, and a Queen. Both players must ante, and then each player is a dealt a single card. There is one round of betting, and the high card wins. Many variations of this game are solved in TMP, and the solution to the specific version of the game that is relevant to this weeks brainteaser is solved in the video below. To solve the three card Blind Man's Bluff game (3CBMB) we just need to notice that you can imagine your opponents hand as your own, flip its ranking, and map it directly to the AKQ game. For example, if you see that you have an A in the AKQ game, that is equivalent to seeing that your opponent has a Q in 3CBMB, and if you behave the same in both situations, you will achieve the same results. For each possible deal of hands, the outcome when those two hands to go to showdown is the same in both games. For each player and for each card that he might be dealt, the information he has about his opponent's hand is the same. For #2, note that in both games each player knows which card one of the players has, and can only infer that the other player must have one of the two other cards with 50% probability each. So if someone playing 3CBMB sees that his opponent has an A, he can only infer that he himself must have a K or a Q with even odds. Under our mapping this is the same as your opponent in the AKQ game having either a K or an A with equal probability, which is what a player seeing that he himself has a Q (the equivalent of a 3CBMB A) would infer. By symmetry this applies to all 3 cards in both games. Applying the AKQ game solution to 3CBMB is simple now that we know the games are equivalent. Player 1 should always check first, then if Player 2 bets, he should always call if his opponent is showing a Q and call with probability 1/7 when he sees a King. Player 2, when checked to, always bets when his opponent is showing a Q and bets with probability 3/7 when his opponent is showing an A.
I got multiple requests for how to turn this into a bar game so that we can use our game theory to win free drinks. This is course the ultimate goal of all of game theory so I put a fair amount of thought into it. The issue with the game as I stated it is that the GTO strategy doesn't profit against weak players unless they do something really dumb, (eg fold when you are showing a Q). The in-position player will win on average but always demanding to be in position sounds sketchy.